Do you have a little girl in your life who loves Disney's Sofia? Then I have the perfect gift ideas for you to give for Easter, end of the school year or just because!! Disney Sofia The First Flower Girl Doll - 10"
Your little "Sofia the First" fan will love this Target-exclusive 10" Flower Girl doll; she is inspired by the hit animated series from Disney Junior, "Sofia the First." This beautiful Sofia doll is elegantly dressed in a never-before-seen gown inspired by the flower-girl fashion she wore at her mom's royal wedding. The floor-length gown is shimmery pink with glittery details and a purple bow detail. A silvery tiara sits on top of her beautiful curls, which can be brushed and styled with the included brush. 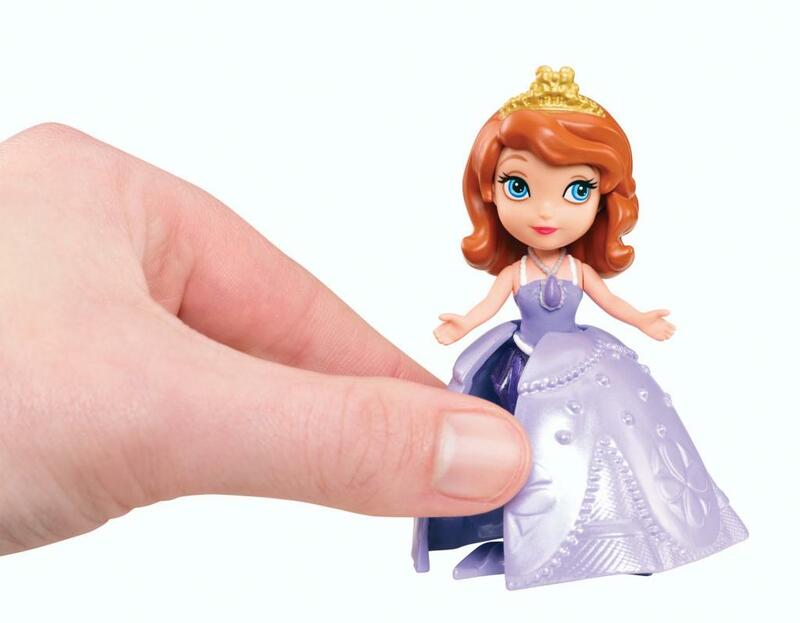 A perfect gift to give along with the Sofia Doll is the Disney Sofia The First Vacation Palace! Girls can join Princess Sofia on her family vacation at sea, aboard this delightful 2-in-1 royal ship. Then she can journey upstairs to the very top level and steer the royal ship from the captain's wheel. But that's just the beginning. Sofia can also embark on mermaid adventures - just like in the Disney Junior series. Whether she's a princess steering from above or a mermaid exploring down below, there are endless ways to play out Sofia's action-packed family vacation at sea. 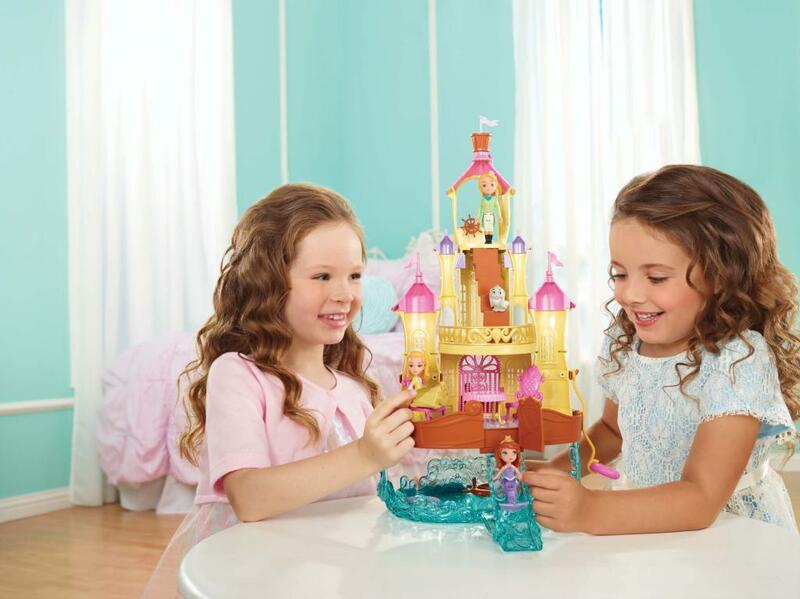 Get 2-in-1 fun when Princess Sofia goes on vacation with her family to their floating palace! She encounters adventure, enchantment, and fun above and below the water. 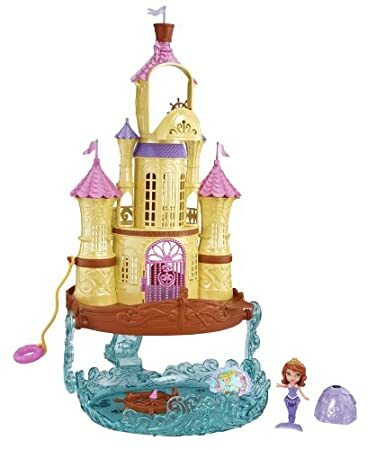 Girls can re-create their favorite scenes from the Disney Junior series with this colorful two-in-one playset that takes girls from aboard the “floating” palace to under the sea - all neatly on a tabletop (or other flat surface). Simply lift up the “floating” palace to reveal an underwater mermaid cove. Princess Sofia small doll is included for play right out of the box - and doubles the fun with a fantastic twist! Remove her princess skirt to reveal a magnificent mermaid tail, also in her signature purple. Girls will love re-living her magical transformation from princess to mermaid - and back - over and over. The doll also works with the Magical Talking Castle (sold separately), unlocking phrases for interactive play. Collect other Princess Sofia dolls and accessories (sold separately) to expand the storytelling possibilities. The little girl in your life will have hours and hours of playing with these Sofia dolls and accessories!